Ultrasound Imaging or ultrasonography is a diagnostic imaging technique using ultrasound waves. It is used to visualize subcutaneous body structures like tendons, muscles, joints, vessels and internal organs such as heart, kidney etc for possible pathology or lesions. It is possible to perform both diagnosis and therapeutic procedures. Obstetric Sonography is widely used in foetal scanning. The term “ultrasound” applies to all acoustic energy with a frequency above the audible range of human hearing. The audible range of sound is 20 hertz-20 kilohertz. 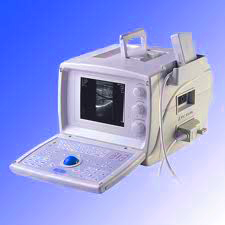 Typical diagnostic sonographic scanners operate in the frequency range of 2 to 18 megahertz. The above frequencies are hundreds of times greater than the limit of human hearing, which is typically accepted as 20 kilohertz. Sonography is effective for imaging soft tissues of the body. Superficial structures such as muscles, tendons, testes, breast and the neonatal brain are imaged at a higher frequency around 7-18 MHz, which provides better axial and lateral resolution. Deeper structures such as liver and kidney are imaged at a lower frequency 1-6 MHz with lower axial and lateral resolution but greater penetration. The velocity of ultrasound waves is identical to that of sound waves in the same medium. In Air, it is 331 m/s, and in body tissues, it range from 1540 m/s to 1580 m/s depending on the type of tissue. A velocity of 1,540 m/s is generally used for soft tissue in sonographic imaging and represents an average of that for a number of tissues, muscles and organs. The Ultra sound wave is typically produced by a piezoelectric transducer encased in a housing which can take a number of forms. Strong, short electrical pulses from the ultrasound machine make the transducer ring at the desired frequency. The frequencies can be anywhere between 2 and 18 MHz. The sound is focused either by the shape of the transducer, a lens in front of the transducer, or a complex set of control pulses from the ultrasound scanner machine. This focusing produces an arc-shaped sound wave from the face of the transducer. The wave travels into the body and comes into focus at a desired depth. Materials on the face of the transducer enable the sound to be transmitted efficiently into the body. In addition, a water-based gel is placed between the patient’s skin and the probe. 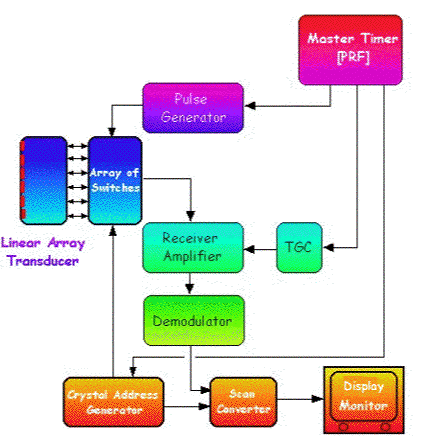 Ultrasound transducers exploit the piezoelectric effect to cause a crystal to vibrate at ultrasound frequencies. The resultant vibrations generate pulses of compressions and rarefactions which propagate through the tissues. Echoes produced by tissue interfaces are then detected by the same crystal exploiting the piezoelectric effect once again. The ultrasound pulse becomes attenuated as it passes through tissue. The switch array is used to excite the multiple crystals in the transducer. In the simplest arrangement, each crystal generates an ultrasound pulse one after the other so that sequential lines of tissue can be rapidly and continuously insonated. Some of the energy in the pulse is scattered through a process called non-specular reflection, some of it generates an echo in a specular reflection process, some of it is transmitted through the interface to produce further echoes at other interfaces and a small amount is absorbed. The reflectivity of an interface depends on the acoustic impedance of the two tissues involved. The sound wave is partially reflected from the layers between different tissues. Specifically, sound is reflected anywhere there are density changes in the body: e.g. blood cells in blood plasma, small structures in organs, etc. Some of the reflections return to the transducer. The scanner operates using a linear array transducer. The Master timer circuit sets the number of ultrasound pulses which the transducer generates every second. This is referred to as the Pulse Repetition Frequency (PRF). The return of the sound wave to the transducer results in the same process that it took to send the sound wave, except in reverse. The return sound wave vibrates the transducer; the transducer turns the vibrations into electrical pulses that travel to the ultrasonic scanner where they are processed and transformed into a digital image. 1. How long it took the echo to be received from when the sound was transmitted. 2. From this the focal length for the phased array is deduced, enabling a sharp image of that echo at that depth. 3. How strong the echo was. It could be noted that sound wave is not a click, but a pulse with a specific carrier frequency. 4. Once the ultrasonic scanner determines these three things, it can locate which pixel in the image to light up and to what intensity and at what hue if frequency is processed. The echo pulses are picked up by the transducer and are amplified by a Receiver Amplifier whose output is demodulated before being fed to a Scan Converter so that the location and amplitude of detected echoes can be displayed. The Time-Gain Compensation (TGC) circuit provides for selective amplification of the echo signals so as to compensate for attenuation of distant ultrasound echoes and suppress more proximal ones. The ultrasound image is known as B-Mode scan and it consists of a 2D representation of the echo pattern in a cross-section of tissue with the transducer position at the top of the image. The locations of echo-producing tissue interfaces are generally represented by bright pixels on a dark background, with the amplitude of each echo signal being represented by the pixel value. Images from the sonographic scanner can be displayed, captured, and broadcast through a computer using a frame grabber to capture and digitize the analog video signal. The captured signal can then be post-processed on the computer itself. Therapeutic applications use ultrasound to bring heat or agitation into the body. Therefore much higher energies are used than in diagnostic ultrasound. Ultrasound sources may be used to generate regional heating and mechanical changes in biological tissue, e.g. in occupational therapy, physical therapy and cancer treatment. Focused ultrasound may be used to generate highly localized heating to treat cysts and tumors . This is known as Focused Ultrasound Surgery or High Intensity Focused Ultrasound . These procedures generally use lower frequencies than medical diagnostic ultrasound from 250 kHz to 2000 kHz, but significantly higher energies. Focused ultrasound may be used to break up kidney stones by lithotripsy. Ultrasound may be used for cataract treatment by phacoemulsification. Obstetric Ultrasound is the use of ultrasound scans in pregnancy. Since its introduction in the late 1950’s ultrasonography has become a very useful diagnostic tool in Obstetrics. Currently used equipments are known as real-time scanners, with which a continuous picture of the moving fetus can be depicted on a monitor screen. Very high frequency sound waves of between 3.5 to 7.0 megahertz (i.e. 3.5 to 7 million cycles per second) are generally used for this purpose. They are emitted from a transducer which is placed in contact with the maternal abdomen, and is moved to “look at” (likened to a light shined from a torch) any particular content of the uterus. Repetitive arrays of ultrasound beams scan the fetus in thin slices and are reflected back onto the same transducer. The information obtained from different reflections are recomposed back into a picture on the monitor screen (a sonogram, or ultra sonogram). Movements such as fetal heart beat and malformations in the fetus can be assessed and measurements can be made accurately on the images displayed on the screen. Such measurements form the cornerstone in the assessment of gestational age, size and growth in the fetus.